Splash Damage Forum - Closest to an official forum for the game, and is very active and helpful for newcomers. Crossfire - A community site for the competitive community. Splatterladder - A web-based server browser and community site for the public communities. Available for free. See Enemy Territory Ultimate Installer. Major open-source game patch (made by community), fixing a lot of bugs and optimizing the game for modern machines (widescreen resolutions, alt+tab minimizing game, etc. ), including latest official game patch, so it can be applied on fresh install of the game. A batch installer that simplifies the installation of the game. While the official download requires you to download the full game and then apply two different patches, ETUI bundles them all to a one installer that includes the most popular mods and unofficial maps. Recommended for new players. It can be downloaded from the official installer site. 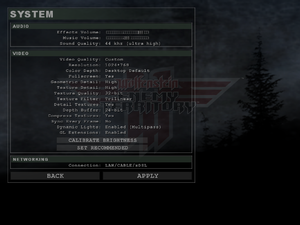 This file is a pre-installed version of Enemy Territory for Linux players created by Psykorgasm from the official Splash Damage forums. If you already have a version of ET installed on your system, remove that before proceeding with this one. 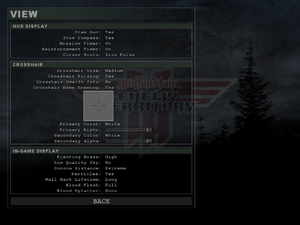 Right-click Wolfenstein: Enemy Territory in the Applications tab and click Minimize. There are also some tools that have been made for easier minimizing. The in-game console can be brought up with ~. 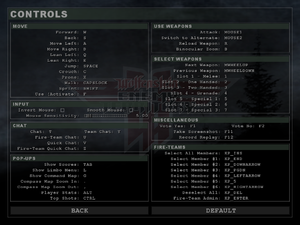 In order to enter commands or variables to the console in-game, you must enter the slash character (/) before every command. While in the game menu (not connected to a server), the slash key is not required. These commands can also be added into an autoexec file to make the game automatically set to those parameters. r_mode [value] Sets the screen resolution according to one of the values in the modelist. A value of -1 will allow custom resolutions to be set. r_customwidth [value] Sets the in-game resolution width (in pixels) to the specified value. This is to be used in conjunction with the r_customheight command. r_customheight [value] Sets the in-game resolution height (in pixels) to the specified value. This is to be used in conjunction with the r_customwidth command. connect [Server IP Address] Connect to a server IP through the console. For password protected servers, add ;password "password"
bind [key] [action] Maps a key to an action. For example, bind mouse1 +attack makes the player shoot when clicking the left mouse button. unbind [key] Unmaps a key. For example, unbind mouse1 makes the player do nothing when clicking the left mouse button. quit Shuts down the game. vid_restart Reloads the map and restarts the graphics renderer. Some changes, such as resolution change, requires the graphic renderer to restart. A full list and explanation of all the possible console commands for the game can be found here. See Widescreen resolution or ET Legacy. 90FPS by default; can be changed by typing /com_maxfps in the console with the number of frames wish. Certain numbers can adversely affect player physics, use at your own risk. Make a profile in-game and set the other video settings you want. Change seta r_customwidth and seta r_customheight to match your resolution. Change seta cg_fov to the Field of view (FOV) you want, e.g. use 100.39 for 16:10 or 106.27 for 16:9. Change seta cg_fov to the value you want, e.g. use 100.39 for 16:10 or 106.27 for 16:9. Use the connect [Server IP Address] in-game console command. If you're running Mumble, make sure the overlay option is disabled in the configuration. Enter cl_allowdownload 1; vid_restart; reconnect to the console. You have been spamming the chat. Just reconnect, and you'll be fine. If a server has sv_maxPing setting set low enough, you may sometimes be kicked upon connecting. Try to reconnect, you usually get through. Evenbalance stopped supporting PunkBuster for ET in October 2011. Thus, new etkeys will not be generated by the game itself, and new players may find they cannot connect to servers running PunkBuster due to this. There is an unofficial solution at etkey.org. They offer an installer that will install the most recent PunkBuster version and generate a new etkey for you. However, keep in mind the installer is in no way supported by any official entity, and therefore should be regarded with healthy skepticism. 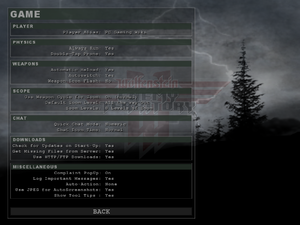 To edit your configuration, you can either use the options provided by the user interface in-game, or edit your config files outside the game. While using the in-game options is much easier, there are many options that cannot be fully edited through the user interface. For example, due to the age of the game, widescreen resolutions have to be set through the in-game console or the config files. This file can be overridden, and it is advisable to do so. To do so, copy the file to etmain (etpro if running etpro) and rename it to autoexec.cfg. ET will automatically look for this file in the etmain/etpro folder and execute it when starting up the game. To modify your config file, either edit the pre-existing console-variables (cvars) within the file or add a new line and enter a cvar and its value. You can define your own variables to perform certain actions and multiple actions at once. Here is an example of a script which changes your class and cycles through that class's weapons without having to open the Limbo menu. seta  class_fo   "class f 1; play sound/chat/axis/64a; echo ^7Field Ops - SMG"
seta  class_med  "class m 1; play sound/chat/axis/62a; echo ^7Medic - SMG"
seta  engy_smg   "class e 1; play sound/chat/axis/63a; echo ^7Engineer - SMG; seta class_engy vstr engy_ns"
seta  engy_ns    "class e 2; echo ^7Engineer - Rifle; seta class_engy vstr engy_smg"
seta  sold_panz  "class s 4; play sound/chat/axis/61a; echo ^7Soldier - Panzer; seta class_sold vstr sold_mg"
seta  sold_mg    "class s 2; echo ^7Soldier - Machine Gun; seta class_sold vstr sold_mort"
seta  sold_mort  "class s 5; echo ^7Soldier - Mortar; seta class_sold vstr sold_panz"
seta  cov_sniper "class c 3; play sound/chat/axis/65a; echo ^7Covert Ops - Sniper; seta class_cov vstr cov_sten"
seta  cov_sten   "class c 1; echo ^7Covert Ops - Sten; seta class_cov vstr cov_sniper"